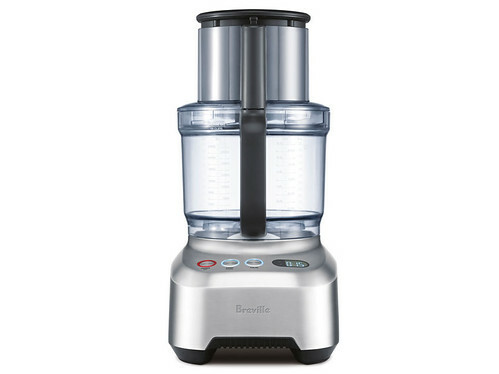 The Breville Sous Chef® Food Processor -An extra wide feed chute lets you process any size food from delicate cheese to hard beets. 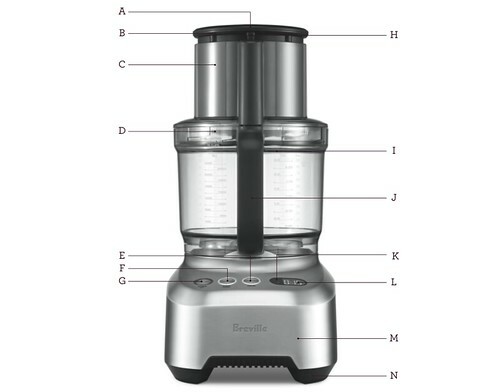 5 disc attachments, 3 blade attachments, 2 different sized bowls; the Sous Chef is versatile in every possible way. C. Super Wide Feed Chute. G. POWER/OFF button. H. Feed Chute Safety System. J. 16 cup Processing Bowl for dry ingredients and 12 cups for liquid (wet ingredients). K. Count-Up & Count-Down Timer. P. French Fry/Vegetable Stick Disc. T. Micro-Serrated Universal S Blade™. NOTE: Processing bowls and attachments are BPA free.